Remigio Mestas Revilla is a hero to many of us in Oaxaca, Mexico, who love indigenous textiles. For 33 years, he has worked with weavers in remote villages to revive lost traditions and preserve those that are at risk of becoming a lost art. His collection can be seen at a new gallery he operates at the Museo Textil de Oaxaca, and at his shop Los Baules de Juana Cata on Macedonio Alcala in the Los Danzantes patio, both in the Centro Historico. Everything is personally selected and made by weavers that Remigio has encouraged and supported over the years. On Tuesday, September 18, 2012, La Jornada, a Mexico City newspaper, published an extensive feature story about Remigio and the weavers he works with. 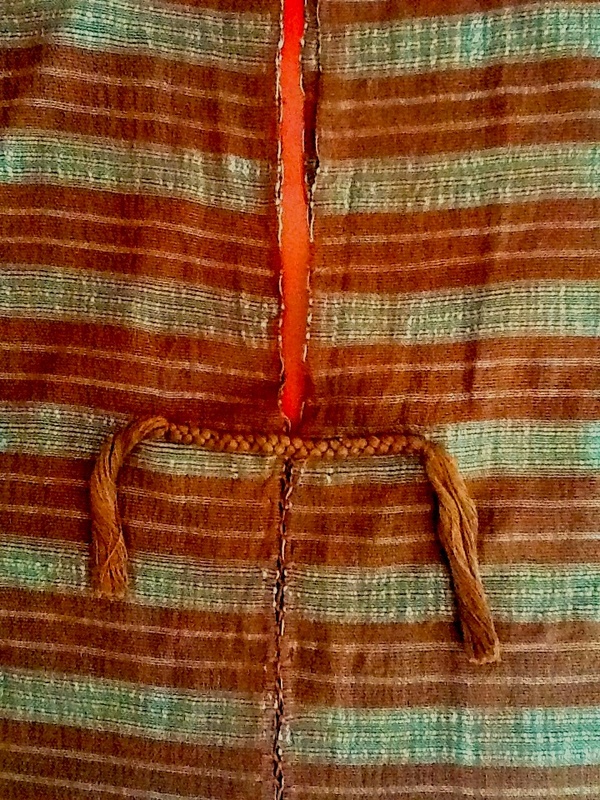 Making a huipil (dress), for example, is a long process that can take six to twelve months of weaving intricate designs on a back-strap loom. And, the compensation is minimal compared with the time invested. “Some techniques have become obsolete,” says Remigio, “because they are so labor intensive.” It is easier for people to give up this work and go to the city or migrate to the United States where they can earn more to support their families than to devote the months it takes to make a garment that might sell for $250 USD. Many visitors come to Oaxaca looking for a bargain and don’t realize the amount of work needed to create a hand-woven or embroidered textile. Walk into either one of Remigio’s galleries and you will see trunks filled and shelves stacked with treasures from remote villages that might be as far away as 15 hours by unpaved, mountain roads. 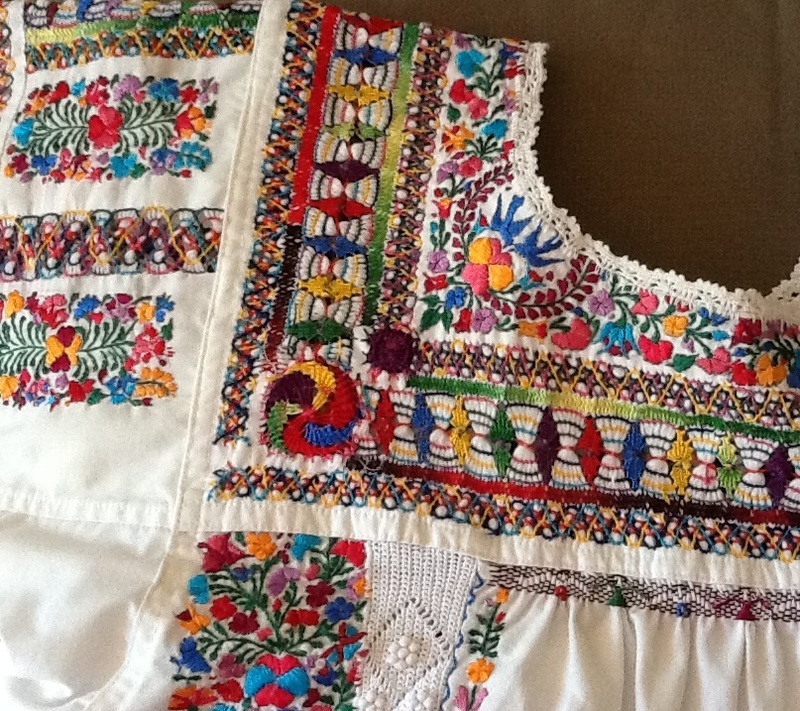 Huipiles, rebozos, blusas, faldas, (dresses, shawls, blouses, skirts) and other traditional garments are woven by Oaxaca’s various indigenous groups: Mixtec, Triqui, Chinantec, Mixe, Zapotec, Huave, Chatino, Amusga, Mazatec, and Tacuate Cuicatec. He encourages them to weave highest quality pieces and he represents them to offer the pieces for sale at an equitable price so that weavers are fairly compensated for their work. Los Baules de Juana Cata and the textile museum shop represent the work of 350 experts who are spinners, dyers, and weavers from the eight regions of Oaxaca. Garments range in price from about $25 USD to fine collector pieces that can be as much as $30,000 USD. Walking into either shop is like being in a museum, too. 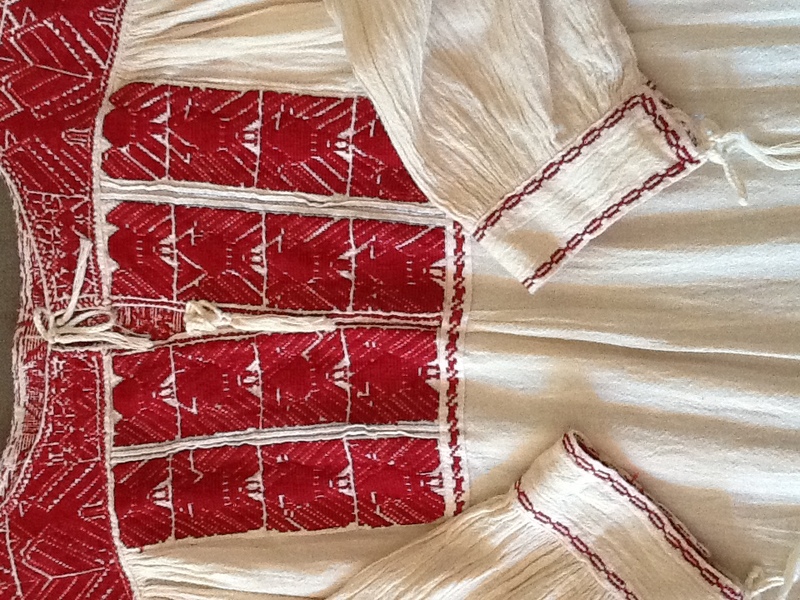 Here we find blouses and dresses woven from silk, Coyuchi cotton (“Coyuchi” is a word used in southern Mexico for naturally colored brown cotton. It is originally derived from the Aztec language and refers to the color of the coyote), wool, sisal, and Egyptian cotton. The materials might be dyed with cochineal, indigo, coconut, or snail (purpua) from the Costa Chica. 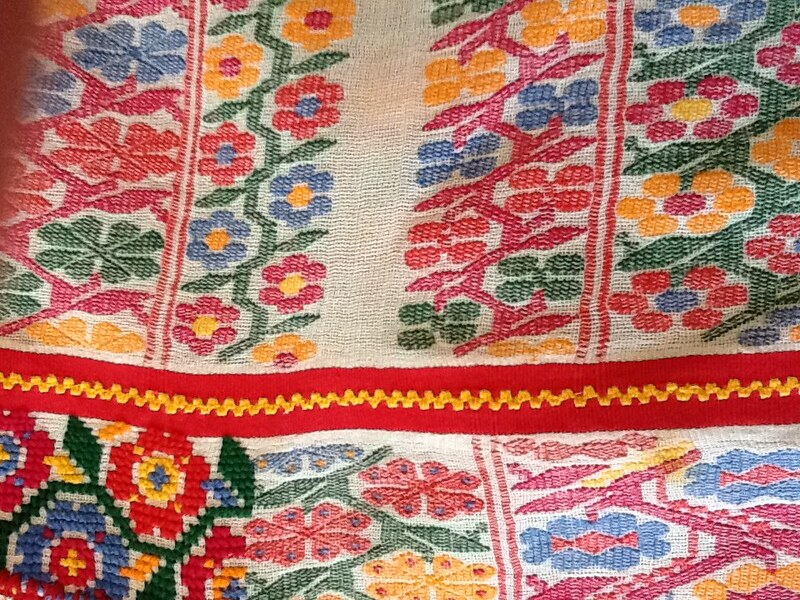 Designs include shawls, wedding dresses from the Sierra Norte, and floral costumes from the Isthmus of Tehuantepec. This is a great place to discover and explore the textile traditions of Oaxaca, learn about the complexity of creating fabric and natural dyes, and discern quality differences. I recommend that you visit these two shops first before you make any buying decisions. You may decide, as I have, that buying one great piece is worth more over time than buying several of inferior quality. How can you tell? By the uniformity and closeness of the weave, by the soft touch of the fabric, and by its natural smell. Remigio was born 40 years ago in the village of Yalalag Zapoteca. From the age of five, he went with his mother to Oaxaca to deliver the shawls she wove. The people she sold to would always negotiate the price. If they would pay her 500 pesos when she asked 1,000, she told Remigio she would make a piece that would fit the price they would pay her. She bought fabric factory and embroidery thread rather than making her own. The decline of Oaxaca textile quality happened over the past 40 years, as weavers began cutting costs to meet the market demand for lower prices. Quality suffered. Some could not earn enough and stopped weaving. After Remigio earned his bachelor’s degree in accounting, he decided to devote his life to changing the economics of weaving, which results in cultural preservation. He has formed an autonomous weaving guild to continue the work and retain the culture. They are not interested in politics or religion. The guild is a mix of Catholics, Protestants, peasants, students, everything, he says. The goal is to promote the weaving traditions with the next generation through training and education, to offer health care services and financial management advice, and to reinvest in the future. It took years for Remigio to get a Visa to the United States. He was repeatedly turned down until the World Bank invited him to exhibit in 1997. 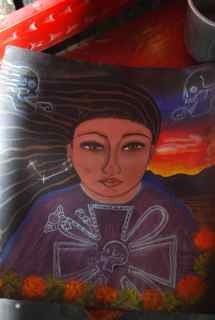 He has been an exhibitor at the juried, distinguished Santa Fe International Folk Art Market. He knows what is lost through out-migration and is committed to helping the Mexican migrant community in the United States return to their roots and re-ignite their pride in hand weaving. Remigio is opening a new Mexico City store at La Calle de Isabel la Catolica, 30-7 in the Centro Historico to broaden the knowledge of indigenous arts throughout Mexico. 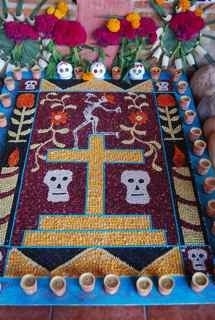 He wants people to understand textile symbolism, that flowers on a Triqui garment represent fertility, that the Quetzalcoatl is there for protection. “We do not weave in bulk. We make pieces that feed the spirit,” Remigio says. Atlanta, GA friends of Oaxaca will host Eric Chavez Santiago and his sister Janet Chavez Santiago on October 3 and 4. They will present rugs (tapetes) hand-woven by their family on tapestry looms, and talk about the weaving, natural dyeing and textile traditions of Oaxaca. If you live anywhere nearby, please make your reservation to attend. We would love to see you. Special thanks to Lauren Waits, Art Gambill, Robin Blocker and Kim Drader Noelter for hosting us. Eric is the director of education at the Museo Textil de Oaxaca. Janet is the coordinator of indigenous language education at Centro Academico y Cultural San Pablo. 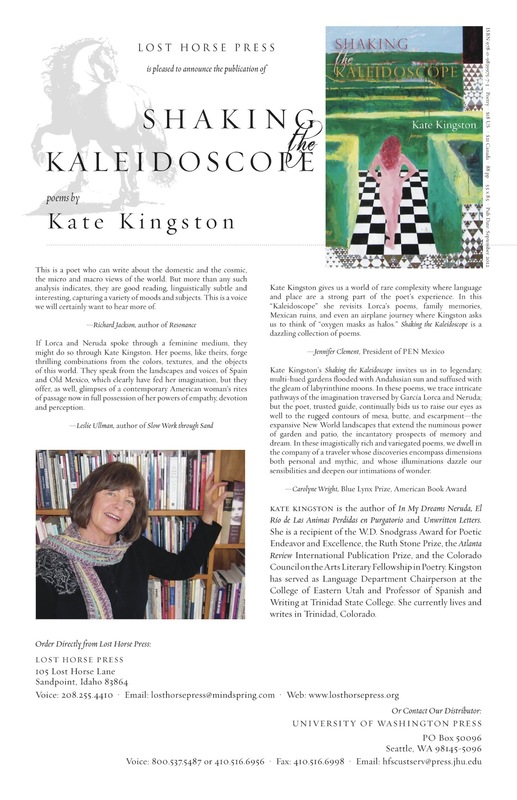 She speaks four languages including Zapotec! Eric recently returned from Beirut and Paris where he participated in an exhibition of textiles from the collection of the Alfredo Harp Helu Foundation. He is now making a documentary video about young people who are continuing the indigenous weaving traditions in remote Oaxaca villages. The museum quality rugs are woven by their family in Teotitlan del Valle using only natural dyes to color the wool that comes from churro sheep. The wool is hand-carded and hand-spun before it is dyed. The family prepares their own dye materials. It is a complex and labor-intensive process that yields amazing colors that are resistent to fading. 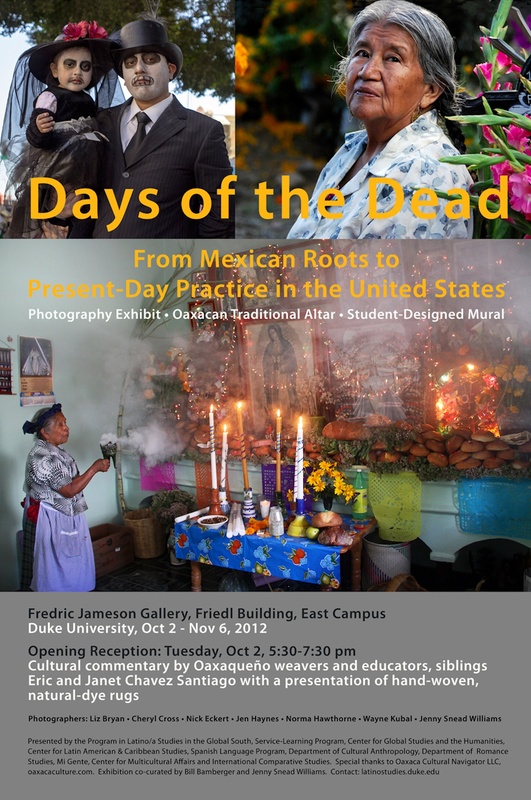 We are coming to Atlanta the morning after the October 2 opening reception for Days of the Dead: From Mexican Roots to Present-Day Practices in the United States, a Duke University exhibit that includes 25 photographs from our 2011 Day of the Dead Photography Expedition. Only ONE space left for this year’s expedition! 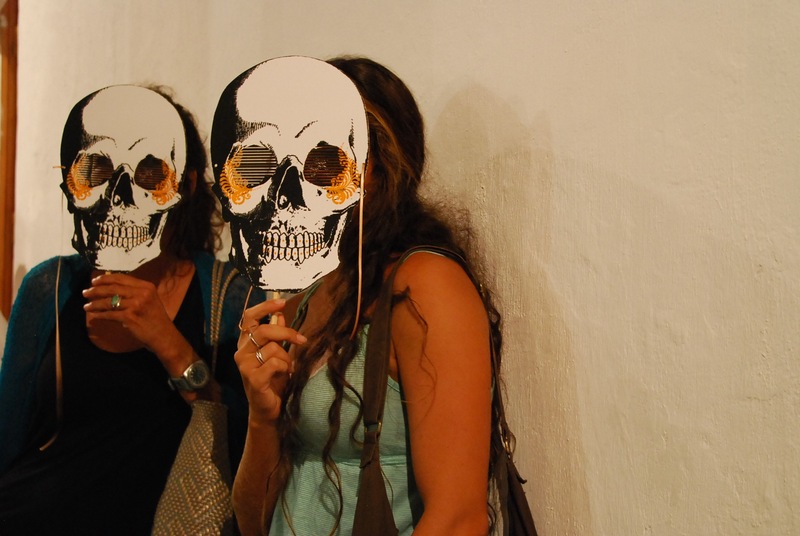 Several years ago Lauren and her family lived in Oaxaca for a year and she participated in a Oaxaca Cultural Navigator documentary film making workshop. 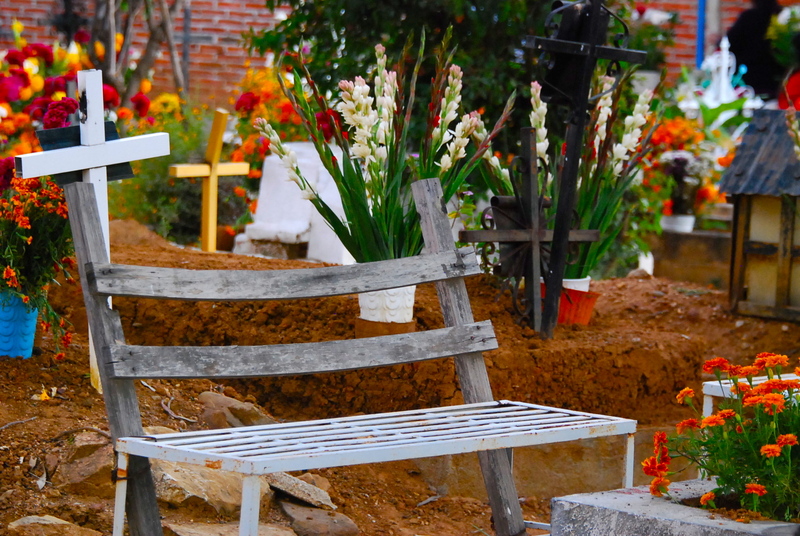 Robin’s daughter, Ellie, was with us this past summer for a photography workshop in Teotitlan del Valle. Thanks to the hosts for making this Atlanta visit possible! 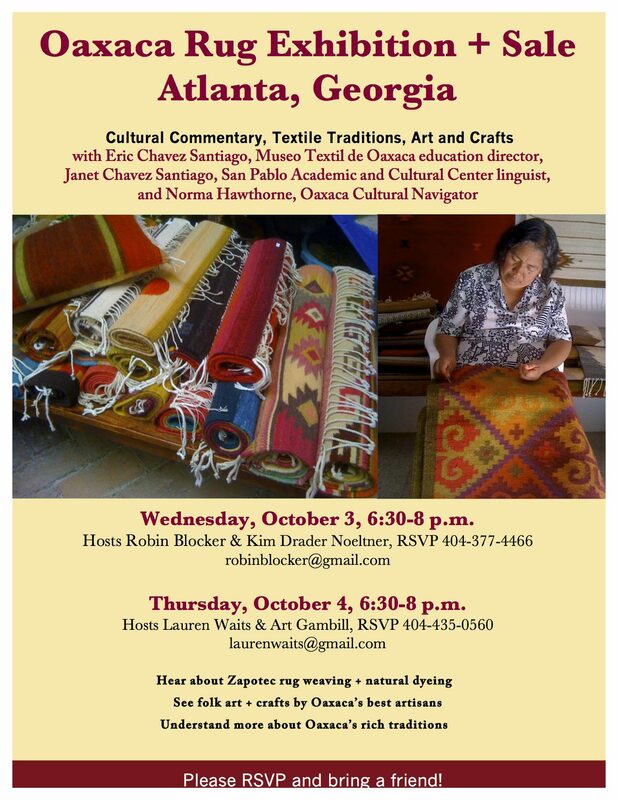 October 2, 5:30-7:30 p.m. at Duke University is the ONLY North Carolina presentation/sale of Chavez Santiago family rugs. Eric Chavez Santiago is director of education at the Museo Textil de Oaxaca, a weaver and expert in developing and using natural dyes. 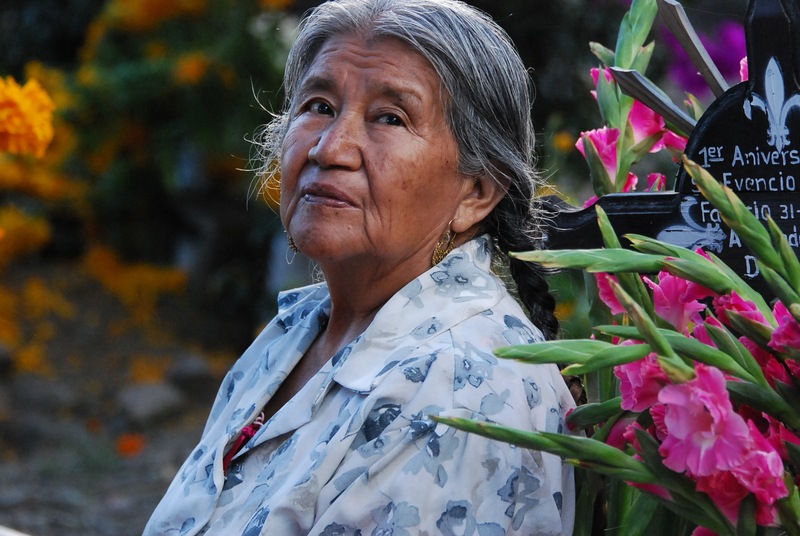 Janet Chavez Santiago is a linguist and education coordinator at the Centro Academico y Cultural San Pablo, where she works to sustain indigenous languages and culture. 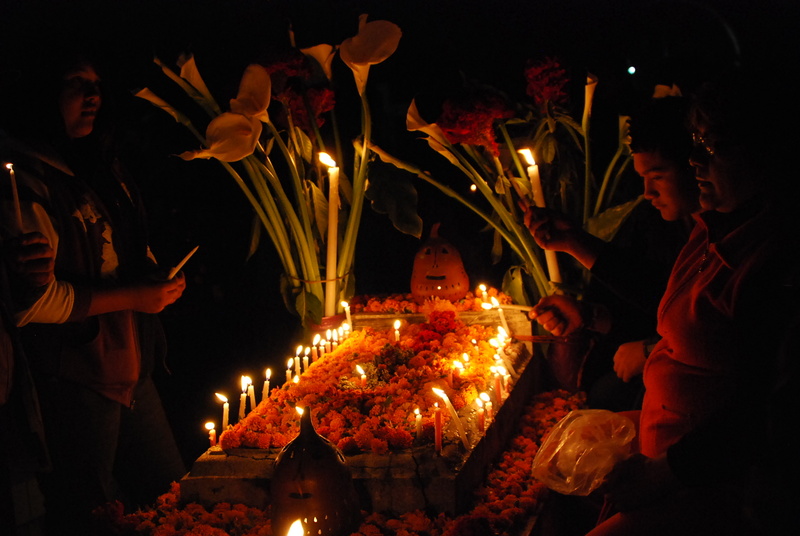 Only ONE space left in the 2012 Day of the Dead Photography Expedition! 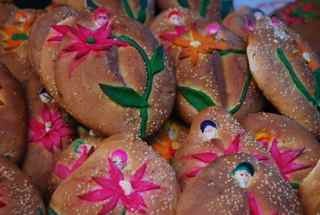 Featured are 25 photographs taken during Oaxaca Cultural Navigator’s 2011 Oaxaca Day of the Dead Photography Expedition. Photographers are Liz Bryan, Vancouver, BC, Canada; Cheryl Cross, Bowie, Maryland; Nick Eckert, Washington, D.C.; Jen Haynes, Vancouver, BC, Canada; Norma Hawthorne, Pittsboro, NC and Oaxaca; Wayne Kubal, Tucson, Arizona; and Jenny Snead Williams, Durham, NC. Duke’s Center for Documentary Studies faculty member Bill Bamberger and expedition instructor, and Jenny Snead Williams, director, Program for Latino/a Studies of the Global South curated the exhibit. We will have two private presentation/sales of Chavez Santiago family rugs in Atlanta on October 3 and 4. If you know people in Atlanta who would like an invitation, please contact me.